Published Tuesday, March 17, 2015 in Greenwire. Chuck Fluharty parachutes into busted rural economies and tries to figure out how to get them out of the ditch. Fluharty’s Rural Policy Research Institute is focused on eastern Kentucky, whose coal fields have bled thousands of jobs since 2012 and unemployment rates reached double digits in the hardest-hit counties. The institute got involved at the request of Kentucky politicians in 2013, putting the region on what’s likely to be a long, difficult journey to diversify its economy and address what Fluharty deems the “resource curse” — when a region’s mineral wealth becomes more economic burden than buoy. But before he took on the challenge, Fluharty said, he had a heart-to-heart with two of the Bluegrass State’s most powerful politicians — Gov. Steve Beshear (D) and House Appropriations Chairman Hal Rogers (R). But there were few clear choices for battered eastern Kentucky. So the Shaping Our Appalachian Region (SOAR) initiative was born to coordinate community involvement and come up with ideas. The nascent revitalization push has some infrastructure-boosting components along with efforts to diversify the economy with, say, tourism and more entrepreneurship. There’s even an effort to do sustainable timber harvesting. Fluharty, 67, is the founder, president and CEO of the Rural Policy Research Institute, which focuses on assessing the impacts of public policy on rural areas. He’s also been a research professor in the Harry S. Truman School of Public Affairs at the University of Missouri, Columbia, and an adjunct faculty member in the university’s Department of Rural Sociology. Kentucky Gov. 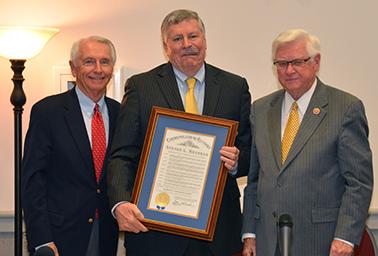 Steve Beshear (D) and Rep. Hal Rogers (R) recognize Rural Policy Research Institute chief Chuck Fluharty for helping launch the SOAR economic development initiative. Photo courtesy of Rep. Rogers. His hope is that SOAR will score a win or two and spread to other Appalachian areas afflicted by coal’s downturn. It might, he added, even serve as a cautionary tale to rural areas that are now feasting on the hydraulic fracturing boom. No community that depends on resource extraction, Fluharty warned, can escape its curse. “It builds a culture of stability and entitlement because of that extraction industry, which always fails because the resource goes away,” said Fluharty, who has also worked in Eastern Europe and with the Organisation for Economic Co-operation and Development. Resource extraction tends to prosper long enough to provide well-paying jobs to multiple generations without too much education. It also gives people a sense that they are contributing to the greater good, but Fluharty says it crowds out other sectors. Fluharty said the problem is exacerbated in Appalachia by its lack of population centers and a Scots-Irish heritage that tends to make people resistant to change. He knows it from experience, having been raised in the Appalachian foothills on a fifth-generation family farm in southeastern Ohio. Former Sen. Jay Rockefeller, a Democrat and a former West Virginia governor, who arrived in the state in the 1960s as a volunteer with the VISTA anti-poverty program, lamented the region’s inability to accept and adapt to change. SOAR’s first summit, at the East Kentucky Expo Center in Pikeville in 2013, had a packed house — 1,700 people. “They learned all of a sudden, ‘My God, this could work,'” Fluharty recalled. “This is a place they swore no one would ever come,” he said, but the arena was filled. SOAR brought two leaders from northern Minnesota’s Iron Range to share their ideas at that forum. Joe Sertich, a former president of an alliance of Minnesota community colleges, and his son Tony, then commissioner of the Iron Range Resources and Rehabilitation Board (IRRRB) and a former state House majority leader, discussed similarities between their rural home and eastern Kentucky. Then came a crash. Mining jobs went from 16,000 to 5,000. It was the resource curse. The two said Minnesota policymakers were farsighted, creating the IRRRB in the 1940s to promote business, community and workforce-diversified economic development. They also said policymakers in the 1970s created a rainy-day trust fund. Interest earned from the fund is used for job programs and to develop value-added products associated with iron mining. Joe Sertich said community colleges in northern Minnesota learned to work together to boost educational opportunities. He served as president of the Northeast Higher Education District. Just as eastern Kentuckians fight with state leaders over resources, the Sertiches said, Minnesota politicians often want to raid the Iron Range rainy-day fund or question IRRRB efforts. Right now, the agency is under scrutiny over a 2006 $625,000 loan to a call center that went out of business and had connections to the Democratic Party. “I say we should make more mistakes, not fewer,” Joe Sertich said. Success is not a destination but a process, the Sertiches said, noting that unemployment in the Iron Range is higher than in southern Minnesota, with its twin cities, Minneapolis and St. Paul. In an interview, Joe Sertich said he predicted SOAR could work in Kentucky. The SOAR initiative is now preparing for its second major meeting this May. Fluharty has been a force behind the effort but has been stepping back, to allow Kentuckians to control their own future. He recommended that they focus on “low-hanging fruit” and set realistic goals. Start slowly now and shoot higher and higher — all the way to 2025. Working groups have been discussing strategies for agriculture and food issues, education, tourism and Internet access. “These people had all the right ideas, and they didn’t have any way to get there because of the structures in place,” Fluharty said. Soon after the 2013 summit, Beshear and Rogers announced the Next Generation Kentucky Information Highway, an effort to expand broadband throughout Kentucky, focusing on underserved areas. At around the same time, Beshear announced plans to expand by 2020 the so-called Mountain Parkway, which connects eastern Kentucky counties to other parts of the state. Wilder said the state is contributing several million dollars to SOAR. The Appalachian Regional Commission, a federal-state partnership that has for decades worked to boost the area’s economy, has also come through with several grants. Help is needed in eastern Kentucky, he said. Beyond SOAR, the federal Department of Labor is providing grants for education and retraining in both Kentucky and West Virginia, the Department of Housing and Urban Development tapped eastern Kentucky as part of its “Promise Zone” program, and last year the Department of Agriculture announced more than $4 million in health and economic aid. The White House has appointed a point man, senior policy adviser Jason Walsh, to coordinate issues associated with Appalachia’s coal mining downturn. Repeatedly slammed by Republicans for waging a “war on coal,” the Obama administration is not popular in Appalachia. Democrats got walloped in last fall’s election, continuing the party’s long regional demise (Greenwire, Oct. 17, 2014). But it wasn’t long ago that West Virginia was a Democratic stronghold, with the party controlling the Legislature for more than 80 years; in the 1990s, the state’s entire congressional delegation was Democratic, including powerful Senate appropriator Robert Byrd. After serving in the House from 1953 until 1959 and in the Senate from 1959 to 2010, Byrd died in office at the age of 92. Sen. Joe Manchin is the delegation’s last Democrat. President Obama’s fiscal 2016 budget proposal includes several Appalachian aid efforts under the name Power Plus Plan. It says the efforts were meant to help communities affected by the coal market downturn. It does not say pollution control and climate policies may be having an impact. But Biden also said in the interview on HBO’s “Vice” that the administration is committed to helping workers who are “going to get hurt” by the industry downturn find new jobs (Greenwire, March 12). “It’s a national responsibility, in our view, to help them make that transition,” he said. Appalachia isn’t giving up on coal. “We have had and continue to have discussions with administration personnel about the EPA rules and their impact on our members, their families and their communities,” said Phil Smith, government affairs chief for the United Mine Workers of America. A big issue, he said, is U.S. EPA’s Clean Power Plan, a draft rule whose goal is to curb heat-trapping emissions from power plants. The agency itself has predicted it would hurt mining and coal power production. “We continue to believe the best action it could take is to revise the rule to reflect a more realistic approach in terms of what is actually achievable and what is not and provide incentives for the commercial development of carbon capture and storage technology,” he said. The Power Plus Plan includes proposed tax credits to help power plants install carbon capture technologies and store the CO2 emissions underground. But the big-ticket item in the administration’s proposal calls for expediting spending of $1 billion from the coal-industry-funded abandoned coal mine reclamation fund over five years. Projects would help tackle pressing cleanup priorities while boosting employment. Appalachian communities welcomed the idea, but it’s controversial on Capitol Hill. Deciding how to spend reclamation dollars has for decades been a delicate compromise. In their own budget analysis document, the committee’s Democrats backed the president’s plan but also suggested tougher oversight of Western coal producers as a way to help the struggling Eastern coal fields. They were echoing a proposal by the left-leaning Center for American Progress (Greenwire, Feb. 9). Despite the disagreements, Appalachia has powerful allies on Capitol Hill, including Rogers, who can use his Appropriations gavel to set aside funding for the region. The spending bill crafted late last year, for example, included at least $10 million dedicated to laid-off miners. Some advocates think additional legislation may be necessary. They point to Pennsylvania Democratic Sen. Robert Casey’s “American Worker and Community Assistance Act” to help workers transition into an economy focused on cleaner energy. Reps. David McKinley (R-W.Va.) and Peter Welch (D-Vt.) have more recently floated a bill to provide significant aid and retraining for displaced workers. For his part, Fluharty is considering more alternatives to coal. He sees an “amazing ecosystem and amazing water” for tourism. “It’s going to be huge,” he said. He also envisions a greater focus on technology, even computer coding academies. And through it all, natural resources development like timber and coal can coexist with whatever new industries take root. The SOAR effort includes input from disparate groups like the West Virginia Coal Association and Kentuckians for the Commonwealth, which has led numerous lawsuits against allegations of mine pollution. The Mountain Association for Community Economic Development, which has for years been calling for more action on economic diversification and is now aiding SOAR, released a report last year pointing to helping entrepreneurs, promoting local food development, and boosting energy efficiency and forestry as avenues for growth. Fluharty has also been in touch with West Virginia officials. Last year, state Senate President Jeff Kessler (D) launched a SOAR-like effort called Southern Coalfields Organizing and Revitalizing the Economy. But that was before the elections brought a new GOP majority in the Mountain State’s Legislature. Republicans have focused on revitalizing the coal field economy by moving to scrap regulations, including canceling an alternative and renewable energy effort championed by former Gov. and now Sen. Manchin. Fluharty said West Virginia is different from eastern Kentucky. He sees more going on at the local level, more philanthropy and public-private investment. But overall, he said, “the state is not committed yet” to an economic development overhaul. Ted Boettner, executive director of the West Virginia Center for Budget and Policy, echoed coal industry leaders in saying that coal may never return to pre-crisis levels, no matter how many rules lawmakers scrap. “I think the first thing, of course, is to recognize the problem,” he said. Boettner did point to progress, mainly a Kessler-backed law creating a West Virginia Future Fund, which would route some mineral development severance tax dollars into a pot for future economic development. Amid all the momentum, Fluharty warns that the economic development effort remains delicate. Funding could dry up. And then there’s politics. With Appalachian politicians under pressure to use coal’s problems to their electoral advantage, he said, many of them would rather not talk too much about diversification, lest they be seen as not being pro-coal.